"Hindus Urge Pope to Reconsider Ordination of Women Priests"
Zed, who is President of Universal Society of Hinduism, further said that as women were equal partners in the society, so they should be equal partners in the religion also. He urged Vatican to be more kind to Roman Catholic women as exclusion of women from religious services, just because they were female, was very unfair and ungodly. Quoting Hindu scriptures, Rajan Zed says: Where women are honored, there the gods are pleased. Men and women are equal in the eyes of God and religions should respect that, Zed stresses and adds that time has now come for the women priests and bishops. Zed suggested that theologians and canonists of the Church needed to address this issue urgently; re-evaluate Church doctrine, theology, male hierarchy and history; and give women a chance. Women should be ordained to priesthood and should perform the same functions as male priests. Treating women as not equal to men was clearly a case of discrimination promoting gender inequality. Church’s Cannon Law 1024 says—Only a baptized man validly receives sacred ordination. Rajan Zed noted that there had been, however, some positive signs regarding status of women in Roman Catholic Church as Vatican invited women to participate in the Synod of Bishops in 2010 and 2008 and girls outnumbered boys for the first time at the altar servers gathering in Vatican in 2010, where about 60 percent of young pilgrims were reportedly female. Holy See being the largest religious organization in the world should show exemplary leadership in women equality to the rest of the planet, Zed pointed out. Zed argued that reprimanding of the US Catholic nuns’ group, Leadership Conference of Women Religious (LCWR), founded in 1956, by Vatican for reportedly raising the subject of ordination of women and other issues was unfortunate. Mission of LCWR, an association of the leaders of congregations of Catholic women religious in USA, included “fostering dialogue and collaboration among religious congregations”, “developing models for initiating and strengthening relationships with groups concerned with the needs of society”, etc. Roman Catholic Church, largest of the Christian denominations with about 1.2 billion adherents, is headed by Pope and headquartered in Vatican. Hinduism, oldest and third largest religion of the world, has about one billion adherents and moksh (liberation) is its ultimate goal." Let's hear it for Hindu Leader Rajan Zed for affirming gender equality in religion including the Catholic Church. Women are created as equal images of God. The Vatican cannot continue to discriminate against women and blame God for it. Zed gently, but firmly, reproved the Vatican for its reprimand of the Leadership Conference of Women Religious. Hopefully, millions of believers will join in to resist the Vatican's move to burn the nuns. It is my prayer that the LCWR and the women's religious orders will declare their independence from the Vatican, and affirm their Sisters' call to ordination. Can you imagine what it would be like to have nun-priests serving God's people in inclusive communities of faith. 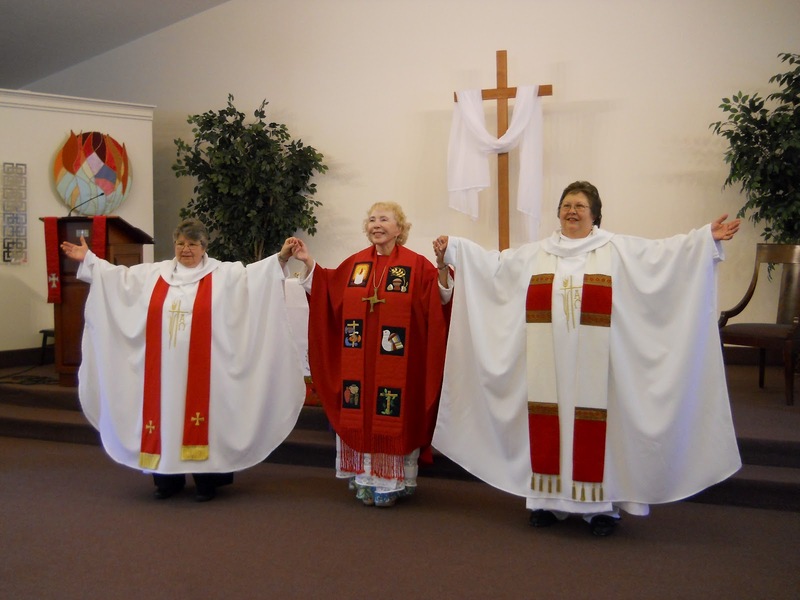 The Association of Roman Catholic Women Priests will ordain women religious who have served God's people for decades. It is time for all of us to stand in solidarity with the nuns and for the women religious to declare that they will not participate in their oppression by the Vatican. Then they will be "free at last!" They have been given up to five years to revise the group’s statutes, approve of every speaker at the group’s public programs and replace a handbook the group used to facilitate dialogue on matters that the Vatican said should be settled doctrine. They are also supposed to review the Leadership Conference’s links with Network and another organization, the Resource Center for Religious Life..."
Clips on Vatican Reprimand of Nuns/ "Burn the Nuns"
I teach in the School of Theology and Ministry at Boston College. As you might expect, in the school we have a number of students—women and men—who are preparing for ministry of one kind or another. As serious students of theology and ministry, the issue of women’s ordination is extremely important for many of them—how this issue is now understood and has been in the past, what the requirements for ordination are, and especially what a clear and adequate theological explanation of this teaching might be. For some of our students, this issue is the most important one they wrestle with. For some of them, what resolution they come to determines whether or not they stay in the Catholic Church. Yet, in the Catholic Church there is a rule of silence. We are told that women’s ordination cannot be discussed. The issue that cries for theological explanation is not to be discussed in schools that have theological explanation as one of their prime reasons for being. In other settings, however, rather abstruse arguments are put forward, usually around “bride ofChrist” symbolism or with a suggestion such as ordination is “God’s gift to men.” Several years ago, as you know, Pope Benedict XVI declared that the ordination of women was a “grave crime” akin to pedophilia. My sense is that these comments are found to be more puzzling, or bizarre, or embarrassing than seriously theological. They beg the issue, raising more questions than they answer. I mention this background because in all of my study, in all of my training, in all of my counseling experience, and in all of my thirty years of teaching I have not come across a single credible thinker who holds that women are not fully able to provide pastoral care . Likewise, I have not come across a single credible thinker who holds that women are deficient in religious development or maturity . From the perspective of practical theology—a theology of the living church—I find there is absolutely nothing that does not support the ordination of women to the priesthood. fact that women were ordained for the first twelve hundred years of Christianity will surprise many people. It surprised me when I first discovered it.” Chapter 4, “Defining Women Out of Ordination,” is as disturbing ecclesially as it is fascinating historically. Without doubt, patriarchy was alive and well in the medieval church. Since 1986, I have been calling every four years for open discussion of women’s ordination at the chapters of my province, the Province of St. Thomas of Villanova. In September of 2010, I wrote to Father Robert Prevost, O.S.A. in Rome, the Prior General of the Augustinian Order, asking “that I be officially recognized as stepping aside from the public exercise of priesthood until women are ordained as priests in our church.” Eventually, I heard back from the Vicar General saying there was “no category” for what I am asking. In February of 2011, I wrote to you, the Cardinal Archbishop of Boston; to my Provincial, Reverend AnthonyGenovese, O.S.A. ; to Reverend Mark Massa, S.J., Dean of the School of Theology and Ministry at Boston College; and to Dr. Thomas Groome, my chair at the school, informing them that I was stepping aside from active ministry as a priest until women are ordained. I also ask that you speak with your fellow bishops so that you can lift the rule of silence on this issue. If you agree with the church’s statements on women’s ordination, please have the courage to teach about this issue in a way that mature, intelligent adults can appreciate, taking into account Jesus’ relating to women and the actual history of ordination. If you have serious theological problems with the church’s statements on women’s ordination, please have the courage to teach about this issue with pastoral care so that the hemorrhaging in our church can begin to stop. Whatever your position ultimately may be, our church—including the students of theology and ministry at Boston College and elsewhere across the country—is in desperate need of your honesty, openness, informed clarity, and leadership. church something you can do as part of your teaching responsibility as a bishop, as part of your caring and your justice? Today we rejoice because two women, Miriam Picconi and Wanda Russell will be ordained as Roman Catholic Woman Priests in a historic ordination in northeast Florida at the Unitarian Universalist Society in Ormond Beach. Together Miriam and Wanda stand on the margins with us in a renewed priestly ministry in an inclusive Catholic Church where all are welcome to receive sacraments. Like St. Mary of Magdala, the apostle to the apostles, Miriam and Wanda, have been called by the Risen Christ to “go and tell” the good news of Gospel equality. For some like the hierarchy, women priests are a revolution, for millions of Catholics, we are a holy shakeup whose time has come. In an ancient Coptic Christian Scripture, “Pistis Sophia”, written in the Second Century, Jesus chooses Mary of Magdala and John to “be on my right and on my left.” Mary’s prominence is reflected throughout the document. She asks 39 out of 46 questions and participates in providing interpretation of this document. Peter expresses resentment toward her throughout the work: “My Lord we shall not be able to endure this woman, for she takes our opportunity and she has not let any of us speak and takes all the time herself.” Mary objects to Peter’s efforts to intimidate her and charges that “ he hates the female race.” History is repeating itself today! The early Church Fathers affirmed to Mary’s leadership among the apostles. Roman Catholic Women Priests are ordained in apostolic succession because a male bishop with apostolic succession and in communion with the pope ordained our first bishops! In 2002, 7 women were ordained on the Danube, in 2006, 12 women were ordained in the first U.S. Ordination in Pittsburgh. Now there are approximately 125. Women Priests are in Europe, U.S. Canada, and Latin America. As part of an international initiative of the Roman Catholic Women Priests Movement, the Association of Roman Catholic Women Priests claims equality as a human right. Our vision is justice for all, justice for the poor, justice for women, and justice for women in the church including ordination. Our liberation movement is living prophetic obedience to the Spirit by disobeying an unjust, man-made, canon law that discriminates against women in our church. Sexism, like racism, is a sin. Women in the Roman Catholic Church are treated like second class citizens. Like Rosa Parks, whose refusal to sit in the back of the bus helped to ignite the civil rights movement, the Association of Roman Catholic Women Priests are renewing and reforming the church. We serve the people of God as priests in a Christ-centered, Spirit-filled, inclusive community of equals. We women priests in ARCWP stand in solidarity with Roman Catholic women and all women. We believe women have the divinely human right to make reproductive decisions on their own behalf-without consulting male priests or bishops. 98% of sexually active Catholic women have used a method of contraception banned by the U.S. bishops. We are also aware of our sisters who live in abject poverty in the U.S. and across the globe. Many of these women have been denied access to affordable birth control by their governments. Others are forcibly denied the use of contraceptives by husbands or male partners who have no regard for their female partner’s safety or volition. The results of this tragedy has led to millions of deaths for women and children throughout the world especially in sub- Sahara Africa and the poorest parts of South Asia where contraceptives are frequently unavailable. If women priests were decision-makers in our church, contraception would not be an issue. Women priests are visible reminders that women are sacred and equal images of God and therefore, have the right and responsibility to plan and care for their families. The New Testament identifies the crucified Christ with the Wisdom of God. …”to those who are called, Christ is the power and the wisdom of God.” ( 1 Cor. 24) The connection in scripture is made between the crucified Jesus of Nazareth and the cosmic Risen Christ in Christ- Sophia. In this liturgy today we integrate this powerful image of Christ Sophia in our prayer and song. Thanks to our music director Kathleen Rosenberg for the beautiful musical Mass of Christ Sophia which she composed. Now we ordain our beloved Sisters, Miriam and Wanda, who will continue to minister on the margins, living compassion and justice no matter what obstacles come in their way. Wouldn’t Mary of Magdala be proud of them? … and us!! Alleluia! "...As the largest leadership organization for U.S. women religious begins to discern what steps to take following news Wednesday that the Vatican has ordered it to reform and to place itself under the authority of an archbishop, experts say the options available to the group are stark. Ultimately, several canon lawyers told NCR, the Leadership Conference of Women Religious has two choices: Either comply with the order or face ouster as a Vatican-recognized representative of sisters in the United States. What’s more, the lawyers say, LCWR has no recourse for appeal of the decision, which the U.S. bishops' conference announced Wednesday in a press release. That release stated that, following a three-year "doctrinal assessment" by the Vatican’s Congregation for the Doctrine of the Faith, Seattle Archbishop Peter Sartain had been appointed to review and potentially revise the organization's policies. That authority, the document said, is granted under two specific canons in the Code of Canon Law that deal with the establishment and work of conferences that represent major superiors of religious orders in different countries. The language of one of those canons, said Morrissey, a professor of canon law at St. Paul University in Ottawa, Canada, is “particularly important” to consider when evaluating the options open to LCWR. The key words there, Morrissey said, is the phrase “can be associated usefully.” Important to recognize, he said, is the fact that the canon does not say that major superiors “must” meet. That means the Vatican “can always, at any time, just remove the recognition of a conference. It certainly has the right to do that,” he said. For the full copy of the Congregation for the Doctrine of the Faith's letter, click here . For the full copy of Levada's letter, click here . It is time for the Leadership Conference of Women Religious (LCWR), representing the majority of nuns in the United States, to issue an emancipation proclamation from Vatican control. "Free at last" as our brother Martin Luther King reminds us, "thank God almighty, we are free at last!." obedience to the hierarchy vs. primacy of conscience. One example, of course, is your refusal to support the Vatican's teaching on women's ordination! Imagine that! Sisters, as you have done so in the past throughout the church's history, speak truth to power. Name the Vatican misogyny publically in your response and express your affirmation of gender equality including women's ordination. It is a "Teresa Kane" moment for the LCWR! I was present when Mercy Sister Teresa Kane clearly and boldly raised the issue of women's ordination to Pope John Paul 11 on his visit to the United States in the Shrine of the Immaculate Conception in Washington, DC. Do not try to "make nice". Name the oppression of women, the sexism, at the heart of this decree. in this decree. Nuns should not be treated as second class citizens by the male hierarchy. The spiritual integrity of women in our church is at stake. Millions of Catholics love and support you, our Sisters. For women religious called to priestly ministry in a community of equals, it is time to move forward with public ordinations as a witness to Gospel equality. This is our sacred heritage. The Association of Roman Catholic Women Priests welcomes nuns to serve our church in renewed priestly ministry in a more open, inclusive, egalitarian church! Justice for all, justice for the poor, justice for women, including women's ordination is our unique charism and reflects your vision too! As a Sister for Christian Community, I am blessed with freedom to live my vocation as a woman priest. I serve God's people in an inclusive Christ-centered, community empowered by the Spirit in Mary Mother of Jesus Catholic Community in Florida! Sisters, the ball is in your court again! It is apparent to many in the women priests movement that the Vatican is the gift that keeps on giving. The more they oppose, the more we grow! May this decree issue in your cry of "enough" as you move forward inspired by the liberating Spirit of God.